My story “The Chex Gambit” is now up at Tina Connolly‘s most excellent Toasted Cake podcast. It takes a little over eleven minutes to listen. This is my first publication via Podcast, and it was such a blast to hear someone else reading something I wrote. It’s not exactly the way I would’ve read it, but that’s the point, isn’t it? Tina does a great job, and then says things that make me sound smarter than I actually am. Maxx Destruktinator, the story’s protagonist, is named after my friend Maxx, aka DJ Maxx Destrukt. I originally used her name as a placeholder for my supervillain, but grew attached to it, and asked permission to keep it. Thanks, Maxx! 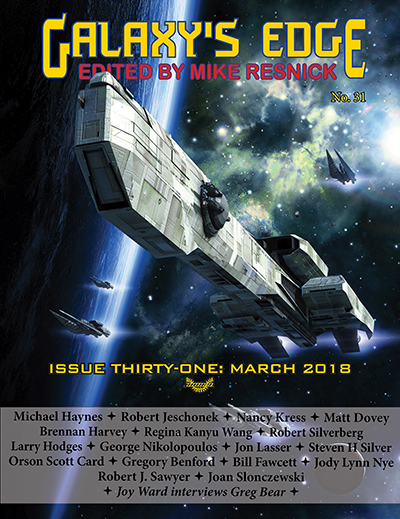 My story “Perfect Little Boy” was published today, in Galaxy’s Edge issue 31. You can read online for the next several months: just scroll through the table of contents to find my story). Alternatively, buy it in e-book (Amazon) (Kobo) or in hard copy. I’m pleased to announce that my short story “Fly Swatter” will appear in DarkFuse Magazine on March 3rd. This is a nasty little flash fiction horror tale, clocking in at about 1350 words. It’s also the first story I’ve published that originated in “Weekend Warrior,” an annual flash fiction contest at Codex, an online writers’ community. Thanks to Vylar Kaftan for her work running the contest, and to all my fellow contest participants who offered their feedback. Inspired by my Clarion West classmate S. Qiouyi Lu, I figured I should probably throw my hat in the ring for 2016 awards eligibility. I haven’t accomplished as much as S this year, so my post will be correspondingly shorter. Like S., I’m also in my first year of eligibility for the John W Campbell award for best new writer. That said, if I was you, I’d vote for S., not me. In fact, I’d actively encourage you to consider S. Qiouyi Lu for best new writer. I saw two stories published this year which are up for consideration in the short story category for both the Nebulas and Hugos, and possibly for other awards as well. “The Star Tree,” a 4200 word science fiction short story, appeared in Writers of the Future, volume 32. It took first place in the fourth quarter of the competition. It’s the story of a boy who’s lost his mother, and of a trading-card game where children can trade entire lost planets. “Real Selfies,” a 2900 word contemporary fantasy story, appeared in Untethered: A Magic iPhone Anthology. In the story, a camera app has the power to take photographs of your darkest fears. If you’re reading for these or other awards, please drop me an e-mail and I’ll send you review copies of one or both stories. I’m an invited reader at this Wednesday’s Two Hour Transport, at Cafe Racer in Seattle. 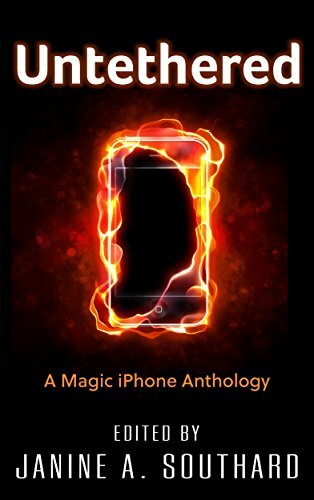 I plan on reading from my story “Real Selfies,” which appears in Untethered: A Magic iPhone Anthology. Untethered has a launch party here in Seattle on Friday night, at Wayward Coffee. I’ll be there too, along with a dozen other contributors to the volume.